In our society so many reach for a pill before they think about using a simple tea , healing food or a simple herbal tincture. Today I'm going to share with you some simple herbal tools you can use when you, your family or your clients get what I call Crud or Gunk stuck in our lungs. Mullein is a biennial plant which means that it lives for 2 years. The first year it looks like the image to your left which I took just this weekend in upstate NY. The second year it will grow a tall flower stalk and go to seed and then the process begins again from the seeds. I posted this picture on facebook recently and I had the funniest comment " what is this furry lambs ear?" So yes, it is very soft and "furry" however the little hairs on the plant can also tend to be very irritating. A friend of mine called it "cowboy's toilet paper".. I have to tell you that if you used it as toilet paper you'd have a very red, itchy bottom when you were finished using it, so my recommendation is not to use it in that manner. If you are harvesting your own mullein, gather it in the fall of the first year plant or the spring of the second year before it sends up its flower stalk. So what is mullein good for? Mullein leaf is terrific for congestion and dry coughs. You know those times when you have stuck gunk in your lungs and you seem to cough continuously to get this stuff unstuck. Mullein is an expectorant and will aid the lungs to release the mucous and phlegm from the walls of the lungs so you can cough it up and rid your body of it. 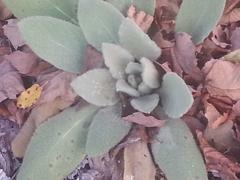 You can take mullein leaf by tincture, tea or by smoking it. I tend to use the tincture but many really like to drink the tea. This is not a simple tea where you just leave it for 5 minutes, that would only give you flavored water, not a medicinal tea. To make mullein tea, fill up a quart mason jar with loose mullein - pack it slightly but don't squash it in your jar. Now fill the jar up with boiling water to the top, cover it and let it steep for a minimum of 4 hours or leave it overnight on your counter. Because of the teeny hairs you want to make sure to strain it very carefully. Straining through tightly woven cotton cloth like a handkerchief or a paper coffee filter is effective. I love this thought. Herbalist, Matthew Wood says "A good remedy for people who think too much and congest the mind or suffer mental tightness and congestion following difficult projects. Mullein gives such a person a feeling like the mind is opened up to breezes on a fresh spring day." Keeping your immune system strong may help you avoid getting sick. A few suggestions are to drink a few cups of bone broth a day (cook your bone broth with astragalus, mushrooms such as maitake, shitake and reishi and seaweed) in addition to nourishing herbal infusions such as nettles, oatstraw, and red clover. Think of mullein for bronchitis, pneumonia, and coughs. 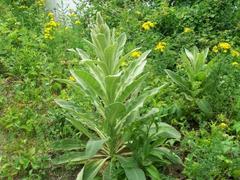 Other herbs I would look at combining with the mullein would be echinacea, elecampane and elder. Perfect description and explanation. Thanks ? Is it ok to add mullein and plantain to bone broth?